City of Chicago is the third largest in the U.S. after New York and Los Angeles, and fourth largest in North America. The population of this megalopolis known as the "windy city" because of regular winds, is about 2 144 people and around 830 towns. Together with the number of people who live in the suburban and urban agglomeration forming Chicago , the number of inhabitants reaches about 9 464 886 people. Chicago is located on the west shore of Lake Michigan, just at the mouth of the river Chicago. 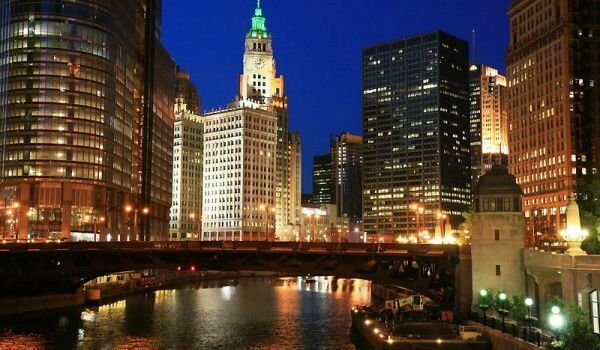 The history of Chicago began in 1833 in the place of Fort Dearborn in 1803. Today in this ethnically charged megalopolis are modern urban Irish, Germans, Italians and Polish. This megalopolis is considered the second most number of Polish population in the world after the capital of Poland, Warsaw. Chicago has one of the largest communities of Bulgarian immigrants. 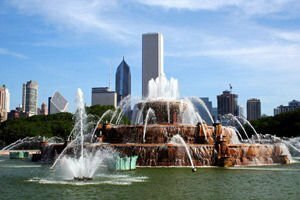 Among the main tourist attractions in Chicago are the beautiful gardens and pavilions, Art Gallery, Buckingham Fountain, the Museum campus, the Aquarium and Planetarium, which are visited by millions of people worldwide. Every museum is a must for the tourist tour of the city, although it may take a whole day. In downtown Chicago the skyscrapers rise. Chicago Skyline is considered one of the most beautiful in the world. The central zone is divided into the southern, which is the financial center of Chicago, and north, where mainly housing, shops and restaurants are located. The so called Downtown is a great place to work and walk. Here is the beautiful shore of Lake Michigan, which together forms the heart of Downtown Chicago. A walk during the day and night in the central parts of the city is an exciting experience that will allow you to enjoy the numerous skyscrapers, shiny shops, luxury hotels and restaurants. The coast of Michigan have great beaches, pretty nice parks and ports. Posh neighborhoods of Chicago are also here. Shores of the Lake offer many pleasant recreations for biking, inline skates or simply walking. Weekends here are deployed by golf, football, and the Lincoln Park zoo, which attracts an overflow of people. Be sure to visit the museum of Chicago, which is also located on the coast of Michigan. Here you can see the famous Buckingham Fountain, which is against the hotel where Al Capone lived, the biggest mafia in Chicago in the 20th century. Behind the hotel is "Michigan Avenue", which is quite a long street, starting from the other side of the lake from Detroit coming through to Chicago. All brands are represented on this street and can take hours to walk around them all. Here is the John Hancock the 3rd tallest building in Chicago. Chicago is a place of American basketball team Chicago Bulls, who iare competing in the National Basketball Association of America - NBA. The team was founded in 1966 and it is related to meat processing tradition of Chicago.